Today, we can view the most current runway fashions nearly instantaneously via the Internet, webstreaming of the major fashion shows, television and other media. We can purchase a multitude of fashion and style magazines that keep us up-to-date on the current trends. However, what did women do one hundred or even two hundred years ago without electronic media? 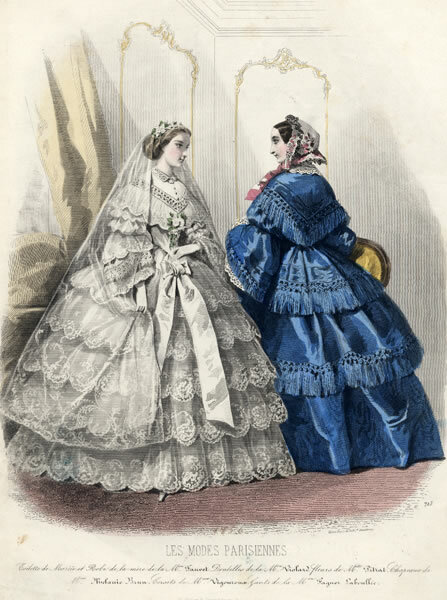 One way they learned of new fashions was by examining the fashion plates that were included in periodicals published in the major European capitals. Fashion plates were originally a way of illustrating current dress styles for consumers, dressmakers, and merchants. They were published in women’s magazines such as La Belle Assemble, Journal des Modes, and the Magasin des Desmoiselles. These periodicals were mostly weeklies that also included fiction, poetry, music and household hints along with the fashion plates. Originally, the plates were engraved and hand colored with watercolors until the 1880s when color printing and chromolithographing became stylish. Fashion plates were popular until the 1920s when photography became the norm for fashion reporting. This exhibit will highlight five eras of fashion plates from the Little Bower Fashion Plate Collection. These time periods are: Directoire/Empire (1790-1820); Romantic (1820-1850); Crinoline (1850-1869); Bustle and Nineties (1870-1900); and Edwardian and World War I (1900-1920). Take a stroll through fashion history to learn about this special collection and what was in style over the past two hundred years.